When the six-year-old daughter of a billionaire industrialist is kidnapped, ueber-consultant Jonathan Knox and counterterrorism agent Marianna Bonaventure must team up with an experimental artificial intelligence to rescue her, never suspecting the little girl is the key to a plot that could destroy the NSA’s most advanced cryptanalysis capability—and go on to kill every man, woman, and child in the United States. Tell us something about DUALISM that isn’t mentioned in the publisher’s synopsis. Okay here’s something almost nobody knew (till now): When I first started to write DUALISM, I had only two short scenes in mind. I knew they both had to be in the book, although I couldn’t figure out where in the book they should go. All the rest of the writing was really about trying to tie those two scenes together. (Readers: you’re welcome to guess which two scenes those are, and what’s more to email your guesses to twoscenes@dualismthebook.com. The first reader to write in and correctly name the chapters and scene numbers for those two literally seminal scenes will win a coveted ticket to join me at the FanFest party being held during this year’s ThrillerFest. For details, see my website. I see Jonathan Knox and Marianna Bonaventure are continuing characters in this story. Did you plan to write a series when you wrote SINGULARITY? No, but then I never even planned to write SINGULARITY (see next answer for how it happened that I did). But, having written that first book, I found myself wondering what would happen to Jon and Marianna going forward. The titles of the first two books evoke that— i.e., they reflect the evolution of Jon’s and Marianna’s relationship as much as they echo the plotlines themselves. You have a highly technical “day job.” What made you decide to write fiction? Anyway, the long and the short of it was: I tried handing off what I thought was a pretty cool concept to three (count ‘em, three!) published writers of my acquaintance, and none of them would touch it—too much science, they said. Well, I didn’t think it was too much science, and I did want to see how a plot based on that idea would turn out. So I wrote it myself. In the course of doing that, though, I also discovered what a rush writing is in its own right—writing SINGULARITY was right up there among the all-time most rewarding experiences of my life. How much of your personal or professional experience appears in the book? As far as professional experience goes, there’s more of that—the whole speaking-truth-to-power consulting shtick and such—in SINGULARITY than in DUALISM. On a personal level, a lot of the philosophical conundrums Jonathan Knox wrestles with, and the existential anxieties he confronts, in DUALISM, resonate deeply with my own experience. Those parts can be hard to write, but hopefully they impart an additional layer of meaning to the book’s all but non-stop action. What is the best advice—and harshest criticism—you’ve received as an author? And what might you say to aspiring writers? Which is to say, you’ve got to edit your own work mercilessly, axing even—no, especially—the parts you love the best, when it comes right down to it. Because it’s going to happen: there are going to be sentences or scenes or whole chapters that you just fall in love with, but which, in the cold gray light of dawn, you realize aren’t moving the story forward. And moving the story forward—well, that’s your job! Everything else is authorial affectation. Reflecting on this answer, though, I must confess I violated Hemingway’s sage advice at least once in the course of writing DUALISM. That is to say, there’s one “darling” scene in there that I couldn’t bring myself to kill, that I in fact fought tooth and nail to save—ask my editor! What are you working on right now? Can you tell us about it? Sure: I’m currently winding up the plot outline to—and warming up the word processor for—the third volume in The Archon Sequence, whose working title is TRIPLOIDY. Once they’ve reached the last line of DUALISM, readers will be able to hazard a guess as to what that title refers to. More generally, though, TRIPLOIDY turns on what I believe is a truly novel scenario for first contact with extraterrestrial intelligence. Both of those elements will come together in a plotline that I envision as a science thriller version of 24. I’m excited to get started on this one! I usually have several works sitting on my reading shelf bookmarked at various states of completion—started, halfway through, nearly done. I pick them up and put them down as the spirit moves me. Could you share one fun fact about yourself that readers may not know? Together with the publication of the book itself on May 13th, I’ll be launching the Psyche Industries website where readers will be able to log on and talk one-on-one with Nietzsche, the AI protagonist of DUALISM. It’s not the “real” Nietzsche, of course, but rather a conversational artificial intelligence avatar that I, together with some other brilliant folks, created to celebrate the book’s release. One AI impersonating another, so to speak. Thanks for visiting with THE BIG THRILL, Bill. 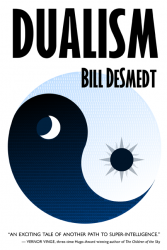 Bill DeSmedt draws on a checkered career history — system designer, AI researcher, management consultant, knowledge engineer — in creating his “Archon Sequence” technothrillers: the award-winning cult classic SINGULARITY, this year’s DUALISM, and, coming soon, TRIPLOIDY. Bill writes from a hilltop aerie overlooking Milford PA, a town whose rich tradition in philosophical and speculative literature serves as an inexhaustible source of inspiration. To learn more about Bill, please visit his website.